I seem to have developed an abiding passion for Japanese hand saws or Nokogiris. I can't seem to get enough of them. Currently I possess eight different types of Japanese hand saws. And even that is just a beginning. For, all I can currently afford are the cheapest, entry level saws, all of which are machine made. The best Japanese saws, I am told, are hand-made and cost the earth - upwards of `20,000! I can't even begin to think of going in that direction. But getting the relatively cheap machine made ones is definitely on the cards as I experiment and try to ramp up my woodworking skills. 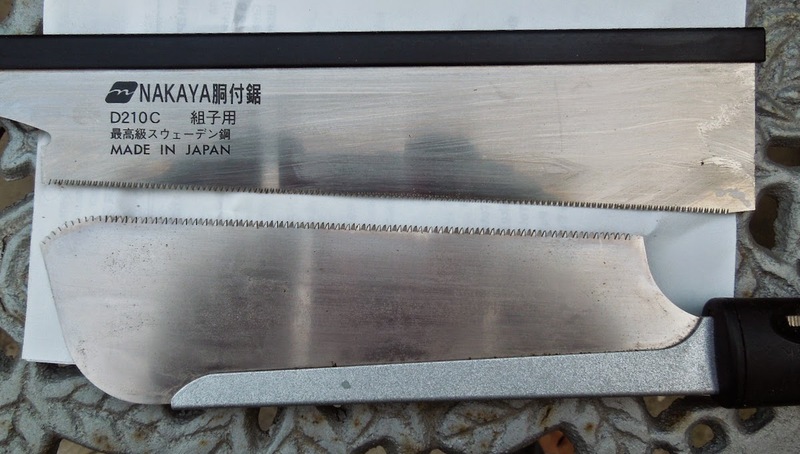 Why my fascination for Japanese saws? I love the clean, quick manner in which they cut and the fine kerf they leave. Most of them seem wonderfully suited for fine joinery work, which is the way I wish to go. Making clean, well-fitting joints of various kinds is compelling. I do not use my Japanese saws for ripping long pieces or cutting sheet goods even though I have one formidable 300mm Kataba capable of taking on fairly hard wood. Japanese saws in general are more fine toothed than their Western counterparts and more fragile. Japanese woodworkers generally work on softwoods and most of their saws are designed for just that. Using them to make long rip cuts on hardwoods like Teak and Sheesham (Sissoo) is not a good idea. Their tiny teeth are liable to snap or the blade to twist. But even the finest of them will easily and beautifully cut small joints like dovetails, small tenons and so on on extremely hard wood. My latest acquisition is a pair of super fine dozukis (backed Nokogiri) made by Nakaya Saw Works, Japan. I bought them from the Japan based toolsfromjapan.com website, which is run by a very knowledgeable gentleman called Stuart Tierney. I went for the saws because of Tirney's description of the saw: "This small, easy to use dozuki made by Nakaya Saw Works has an enviable reputation as one of the finest cutting saws available…this saw makes a cut so fine that many saw's plates cannot fit into the kerf, let alone cut so fine. Intended for the finest rip cuts in joinery and detail work, it is an excellent saw and despite it's delicate appearance, is very easy to use for the novice woodworker or seasoned expert. " The cross cut saw has 32tpi cross cut teeth while the rip saw comes with 17tpi rip teeth. Both are made of Swedish steel and have a thin 0.2mm saw plate, 0.26mm kerf width and 210mm blade length. Both saws come with Rattan wrapped solid wood handle with fixed steel spine and a blade retaining bolt. The blades are replaceable. These saws are considered to be on the low end but I am more than delighted with them. In fact these are easily the finest saws I have laid my hands on. Moreover, as a hobbyist I would not be able to do justice to hand-made high quality tools even if I could afford them. These saws are made by the Nakaya company which has been in business since 1907 and currently runs a factory in Sanjo City, Japan, which was established in 1961. Company Name Nakaya Company Ltd. I experimented with the saws and was highly pleased with the results obtained. See the magnified photographs of the cuts I made on a scarp piece of Sheesham below to get an idea of how fine these Nakaya saws can cut. I intend to use my two Nakaya dozukis solely for small joinery, especially dovetails and small tenons. I hope they will serve me for a long time.